Congratulations to Suzy Choi on winning our fifty third High Five Giveaway! Thanks to all who entered. 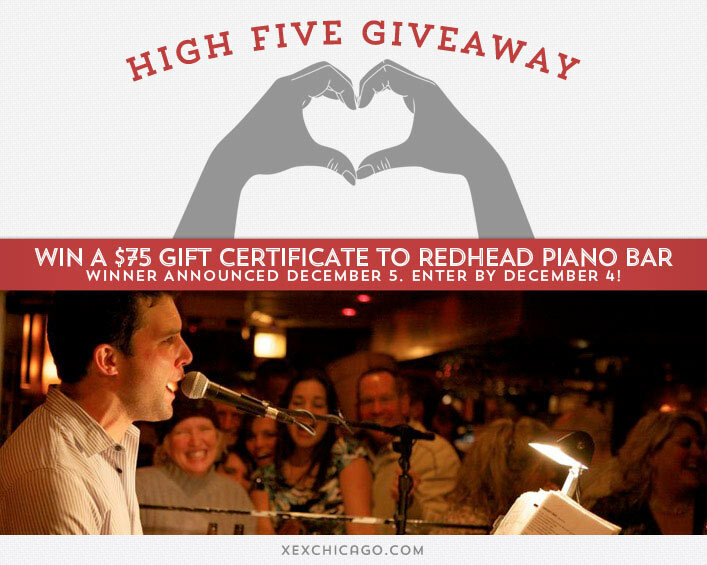 Redhead Piano Bar is located at 16 W. Ontario St, Chicago, IL. Visit their website at theredheadpianobar.com or call them at 312.640.1000 for more information. With French balayage, should color be painted horizontally or vertically? Hint: Check our our latest blog post for the answer. Now, just add a comment to this post with the right answer to be eligible to win! The winner will be announced on Thursday, December 5. Enter by midnight on Wednesday, December 4! Vertically – love this place! French balayage should be painted vertically. It should be painted vertically. Color should be painted vertically!